Friday, October 17th, Shengri La is home to not just its usual Ode butterfly Hunt, but also to a Monarch Migration butterfly hunt. Our hunts on Shengri La start at 7 am SLT and at 5 pm SLT. The sims close to the public at 6 am and at 4 pm to allow the butterfly handlers to release the butterflies. To participate, pelase join us on any of the Shengri La sims in Second life, or just follow this link. Over the weekend of October 17-19, 2008, there will be a massive migration of Random Calliope’s Ode Butterflies through Second Life. Commencing on Friday, October 17 from the Science Friday sim, the Ode butterflies will wind their way throughout SL to celebrate the North American Monarch Butterfly Exhibit at the Science Friday sim and in general raise awareness of the awe-inspiring real life annual North American Monarch Butterfly migration. Random Calliope is a creator of wearable art. He is a master craftsman and the work that he does with microprims is truly breathtaking. He has been creating jewelry in SL for almost three years and while he has created pieces that have fetched some truly awe inspiring sums for charity, what may be equally impressive are the pieces he creates simply to give away. The Science Friday Group in Second Life are fans of National Public Radio’s Science Friday show, which is broadcast every Friday live in Second Life, from 11 AM to 1 PM SLT. Science Friday is also broadcast live over public radio stations nationwide as part of NPR’s ‘Talk of the Nation’ programming. Each week, Science Friday focuses on science topics that are in the news and tries to bring an educated, balanced discussion to bear on the scientific issues at hand. In Second Life, Science Friday listeners gather for a lively chat discussion of the program. One of the recent segments was on the migration of monarch butterflies. The butterfly hunts that allow one to obtain Ode jewelry are a homage to the once very popular community butterfly hunts of days gone by, but this time with a science and conservation twist. Proper gentlemen and gentlewomen would pack their picnic baskets in the spring and summer and head off to the nearest flowered field. There they would use their butterfly nets to capture prized butterflies of infinite variety. The Ode monarch migration hunt is a hunt to see and learn, not to capture. The community gathers in a field to look for butterflies. They may be in trees, floating around, in the grass, or anywhere a butterfly might be found. The hunts work in this way. Pieces of Ode jewelry are put in selected butterflies and then released in a pack of decoy butterflies. There is a script contained in each butterfly that allows it to fly in a random pattern around the sim. When the hunt begins the participants need to find and click on the butterflies to receive a prize. This special monarch migration will include science elements: a map of the monarch migration in the real world, a sculpted milkweed flower demonstrating the relationship between butterfly pollinated plants and the conservation of species, free milkweed plants so that you can learn to recognize the plants upon which these butterflies survive, an exhibit of butterflies under the microscope, and the conservation measures that you can take at home to conserve these precious insects in real life. Monarch butterflies ARE living jewels! Ode is an 9 piece jewelry set (hair piece, earrings, necklace, pendant, brooch, bracelet, ring, garland) which at this moment has 25 color variations. The challenge is to complete full sets of one color for your Ode butterfly collection; however, Ode pieces can only be obtained through participating in Ode Butterfly hunts and/or through trading with other collectors. New varieties of butterflies are occasionally added and some variations such as the Platinum and the Shades of Golden are extremely rare. To stay informed of when the Ode Butterfly Hunts are beginning please join either the SL Ode Butterfly Collectors group or the Ode Butterfly Collectors Subscription group by clicking on a kiosk at either Ode Butterfly Clubhouse at Ode or the Welcome Area on Shengri La sim. In honor of the Monarch Butterfly migration, the Fashion Research Institute is once again pleased to host a five-sim Ode butterfly hunt on our Shengri La sims. Ode is a lovely jewelry set created by the inestimable Random Calliope. Ode has been created in a large number of colors (22 the last I heard) which are transferrable. This means that both guys and girls can hunt for these babies – gentlemen, it’s a great chance to collect jewelry that you can give to lady friends. The fact the jewelry pieces are transferrable means that you can swap pieces until you collect a full set of your desired colors. For that matter, collect them all! Ode-containing butterflies will be released twice on Friday, October 17th. The first release is at 7 am SLT, and the second is at 5 pm SLT. The five Shengri La sims will be closed to the public one hour prior to the release and opened promptly on the hour. There will be butterflies released on all five sims. Not all butterflies contain a piece of Ode – which is why it’s called a Hunt. To ‘capture’ a butterfly, just right click and touch it. If the butterfly contains a piece of Ode, it’ll give it to you, and then vanish. Bring your friends, or hunt on your own – either way, our visitors all assure me that they have a great time at the Ode hunts. If you’ve never experienced an Ode hunt, the five sim hunts are enormous fun. There’s plenty of room for hunters to spread out, and lots of butterflies released throughout the hunt. Ode hunts are offered on the Shengri La sims on the 17th of every month. So if you miss this one, we’lll see you next month! 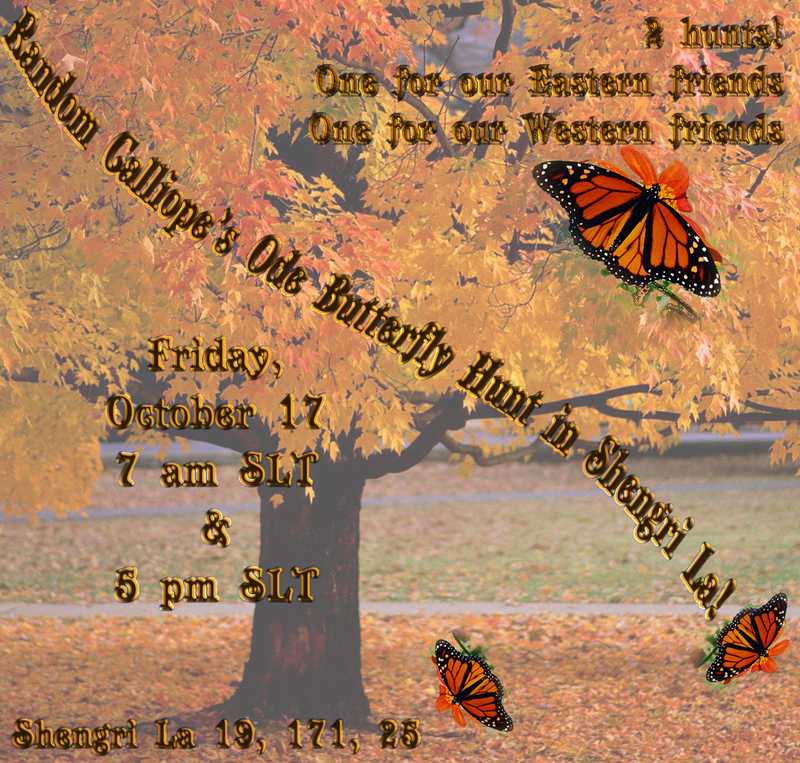 Please join us in the Second Life™ Shengri La islands on Wednesday, September 17th to hunt for Ode containing butterflies. There are two hunts, the first begins at 7 am SLT, the second at 5 pm SLT. The islands will be closed to the public an hour before each hunt starts to enable the butterfly release. They will be reopened promptly at 7 am SLT and at 5 pm SLT. Butterflies will be released on all five sims, and the estate will open on all five sims concurrently. Shengri La will host Ode butterfly hunts every month on the 17th, so if you can’t make it to this one, there will be others. To my customers of long-acquaintance, I’ve finally gotten around to setting a date for Prim & Proper’s final appearance for sale on the Second Life tm grid. I’ll be hosting the sale on behalf of Relay For Life, so you get to have the satisfaction of knowing that while you’re satisfying your last P&P need you will also be doing good. The dates selected are June 14 to 21st. The vendors will be placed the evening of the 13th going into the 14th, and the sale runs till 5 pm SLT, June 21. On June 21, we’ll be hosting an Ode hunt in the morning in honor of Midsummer’s Eve. To kick off the festivities, we’ll be hosting an early Midsummer’s Night Eve Rave starting at 6PM SLT.on June 14. More details on that to follow.